The hardest thing for me when cooking for a group of people is choosing which dessert to make. So many options, so little time, and realistically, I can’t make a full on wedding dessert table every time someone comes over. So this year, for Thanksgiving, I settled on this little number, which I have never made before, but I can say without any doubt that everyone loved it what can go wrong when you mix two classics? 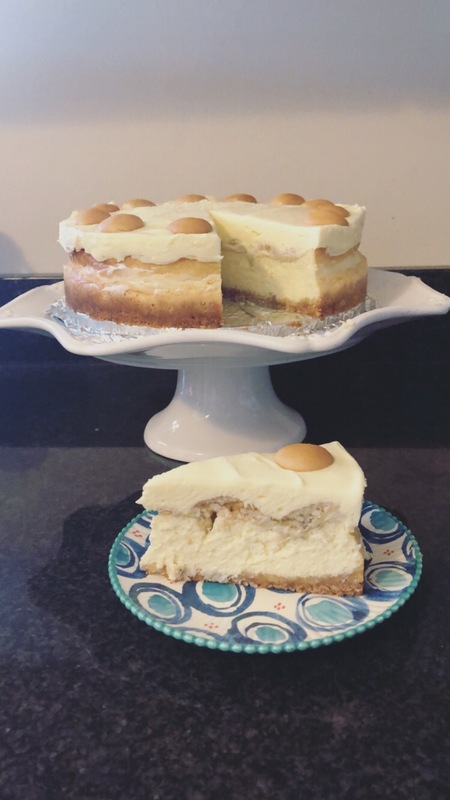 Cheesecake and banana pudding on their own are amazing, but put them together and you have a winner. For the cheesecake part I used my light as a feather cheesecake recipe, just changing the crust a little, which i’ll explain below, and for your convenience i’ll also list the ingredients I used down here. For the full instructions click on the link! Mix the crust ingredients and press them into a greased cheesecake pan. Whisk the cream cheese and sugar till smooth, then add the rest of the ingredients, mixing till everything is combined. Pour into the crust and bake as directed in the cheesecake recipe. Once the cheesecake has completely cooled down start preparing the banana pudding. In a bowl whisk together the instant vanilla pudding mix and water for two minutes before adding in the sweetened condensed milk. Once everything is combined add the chilled heavy whipping cream. If the pudding mix is too liquidy refrigerate it for at least an hour before adding the whipped cream. Continue to whisk the mix until soft peaks form. Make sure to scrape the bowl down with a spatula in between to make sure everything is mixed well. Layer the banana slices onto the cheesecake evenly. Then layer on the Nilla wafers. Once the base of banana slices and Nilla wafers is even, spread the pudding mix on top, spreading to even it out. Smooth out the sides, cover and chill overnight. I tried making it and the cheesecake turned out perfect but the pudding mixture topping didn’t turn out to be that creamy fluff texture, it was very thin not exactly as in the picture or in the video. i whisked with electric beater for a long time but no use.